Whether you are thinking of renovating your old bathroom or constructing a new one, you should realize that frameless glass shower doors are currently your best option. Old or new, your bathroom will definitely look grander with a touch of class offered by glasses. In case you have not noticed the trend, shower doors are now built to add to the aesthetic value of your home. They are no longer just a necessity, but the sleek and elegant custom glass shower doors are made to be a part of your home’s interior décor. · Deluxe appearance:Your bathroom can look like something out of a magazine with just a simple touch of glass. The glass shower doors can give your bathroom an exotic appearance that no shower curtain or framed door can rival. It complements the rest of the décor arrangement of your home, providing added aesthetics. They can easily blend with the rest of your décor to provide the ambience of luxury and comfort. · Added space effect: The use of glassshower door gives the appearance of added space. Even though it may not necessarily create more space, the glass creates the impression of additional space due to the absence of harsh lines. This will definitely enhance your bathroom experience, making the bathroom look brighter and more spacious. · Customizability: This is perhaps the best part of using a frameless glass shower doors for your bathroom. Modern glass shower doors can be customized to suit the user’s taste and utility. There are various options of finishes and structures to suit the existing interior design. For instance, you can select the level of transparency of the glass, the size of the enclosure, where the door will slide or swing to and of course the shape. · Enhanced safety: The design and structure used in constructing frameless glass doors enhance the safety of your bathroom. In order to withstand pressure and force, glass shower doors are manufactured to be impenetrable. In addition, the door edges undergo special treatment to guard against scrapes and cuts. These doors are safe enough for everyone, including children and the physically challenged since they are designed with precision to fit into any space. · Durability: Some of the safety measures structured into the frameless shower doorsguarantees that it lasts longer. The thick glasses for instance boost the durability of the glass. They are generally built strong enough to withstand blows and even heat to some extent. In addition, there is reduced risk of mold and mildew that can reduce the lifespan of your enclosure because the door is without any metal frame. · Higher resale value: Presently, most people prefer frameless glass shower doors to the traditional doors and curtains for obvious reasons. Remodeling your bathroom or building a new one with frameless glass doors will add value to the property and increase the chances of your selling it. Investing in glass shower door is a wise decision. The demand for frameless enclosures is high therefore more buyers will be attracted to your home if you desire to sell it. · Requires minimum maintenance and cleaning: The glasses are built for wet and steamy environmentthus lessening the presence of undesirable organic growths. There is less likelihood of rust that might reduce the functionality and durability of the glass shower. The absence of metal frames and grooves mean less dirtiness from soap crust and lime scale. These factors make cleaning and maintenance easier and simpler. 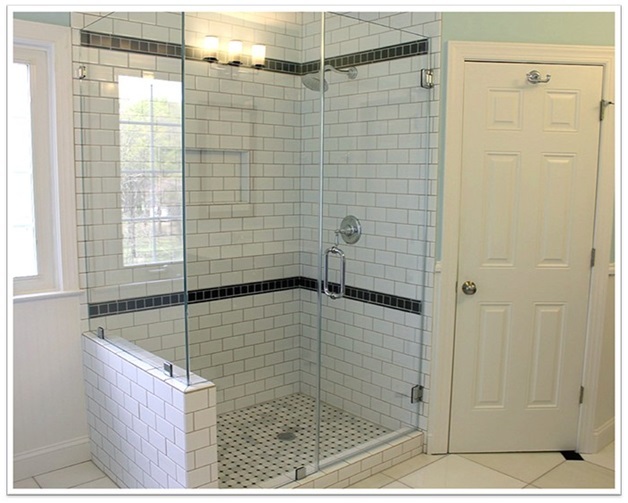 · Frameless glass shower doors may be a bit more expensive than other shower doors. · If not tempered, the glass may shatter under excessive pressure or heat though this is a rare occurrence. · Ensure that the shower walls and floor are in top condition as any sloppiness can create problems during the installation. · Is the shower head pointing at the tiled wall or where the glass door will be located? If it is aimed at the door or glass, there is likelihood of water leakage. · Make sure you hire professionals for every aspect of the installation process, including plumbing and wiring. · Do not forget to adhere to the building codes of your vicinity. · For new bathrooms, make sure you choose the most suitable spot for your glass shower door. · Opt for fixed or movable glass transom so as not to obstruct the movement of the glass door. There are some frameless glass shower door manufacturing companies that offer full DIY options with technical assistance and video tutorials if you wish to install it yourself. This will allow you put your creativity and skills into use while also customizing the door to your taste. You can also hire professionals to do the entire job for you. Either way, frameless glass shower doors are best in terms of functionality and aesthetics.